Cuba and The Bahamas: These two island nations are separated by only 14 miles, yet are worlds apart. With our anchor in 30 feet of water, Blue Pearl is on the edge of a 600 foot drop-off. 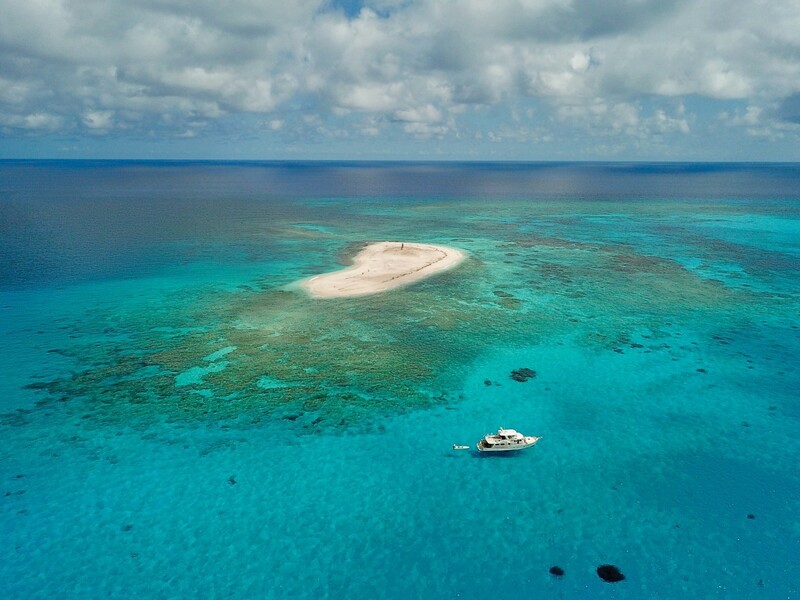 This is the kind of anchorage my husband Don and I dream of, with our anchor set at 27 feet in clean white sand and our stern at the edge of a coral wall that drops off hundreds of feet. Perfect for two cruising scuba enthusiasts; it is just what we hoped to find in Cuba. It’s just like our favorite secret spot in The Bahamas. The water is crystal clear, the air is 88 degrees, the water is 88 degrees, and we can’t wait to get in. But in Cuba, we are never quite sure if we are about to break the law. Consider that just a few hours from the Florida coast these two island nations entice us to explore their cruising grounds. Both have marvelously clear waters and warm, friendly people, yet our experience traveling around the two countries is as different as night and day. We were thoroughly enchanted by both, so why would we go back to The Bahamas in a heartbeat, yet hesitate to say we would ever cruise again in Cuba? 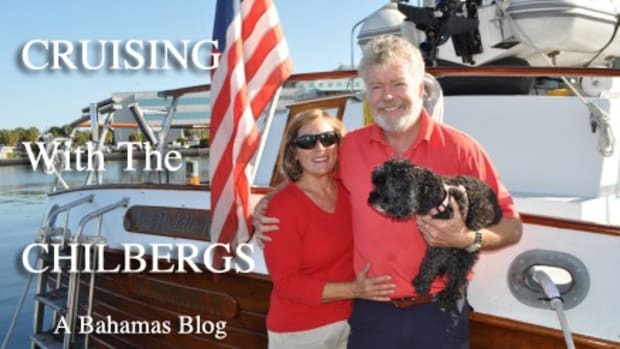 In just a few words, cruising The Bahamas is relaxing, lovely, engaging, welcoming, easy. Cruising in Cuba? Intriguing, vibrant, decrepit, anachronistic, funky-hip, mesmerizing … and not so easy. The difference in the experience of cruising these two island nations is rooted in the country’s distinct colonial histories and, for us, in their governments’ different relationships with the United States. At its closest point, The Bahamas is only 45 nautical miles from the Florida coast. Hundreds of American cruisers are welcomed each year. It couldn’t be easier to visit. 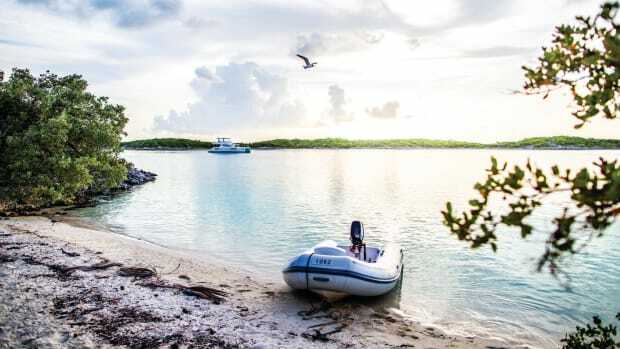 The official website (bahamas.com) includes up-to-date information on entering and exiting the country and you can print out the customs and immigration forms ahead of your trip, as well as fishing regulations, marina guides, and nearly anything else you want to know before you go. Cuba is also close—only 94 miles from Key West to Havana. Yet with the U.S. embargo keeping American tourists away for nearly 60 years, the island had nearly become the stuff of myth. So of course we wanted to go! But we had decided on two requirements before we would make the trip: We wanted to spend an extended period of time cruising and exploring, and we wanted to do it all legally. Given that the U.S. government only issued permits for visits of up to fourteen days, we were stymied immediately. 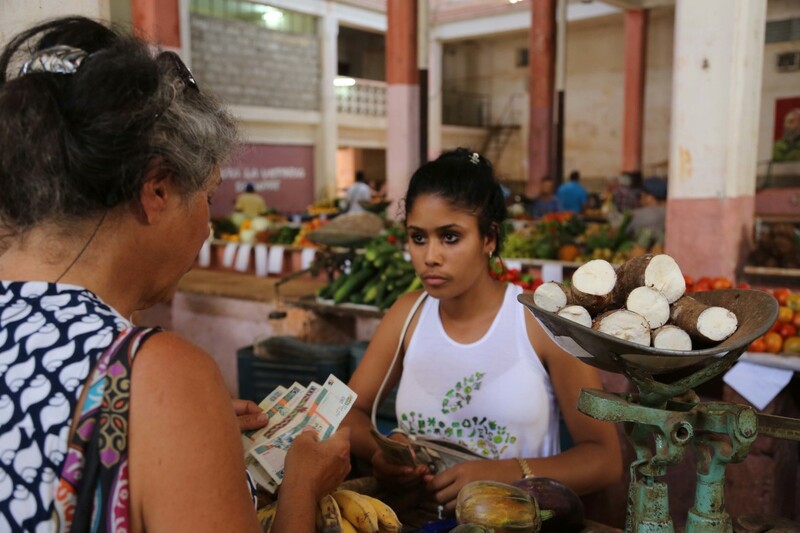 Counting CUCs: Provisioning is complicated by Cuba’s two currency system. Over the next four years, we tried several avenues to get the permission to go. The U.S. does not allow Americans to travel to Cuba as tourists, so first you need a reason to go that fits within the 12 categories of allowed activities. Every cruiser must obtain a CG 3300 “Application to Enter Cuban Territorial Seas” from the U.S. Coast Guard. For our extended travel we also had to get a BIS Export License which required approval from the Treasury Department, Homeland Security, Department of Defense, the State Department, the Department of Energy, Department of Justice, and the Intelligence Community. We advise anyone wanting to go to find both a lawyer familiar with the process and a Cuba travel guide company to pave your way. 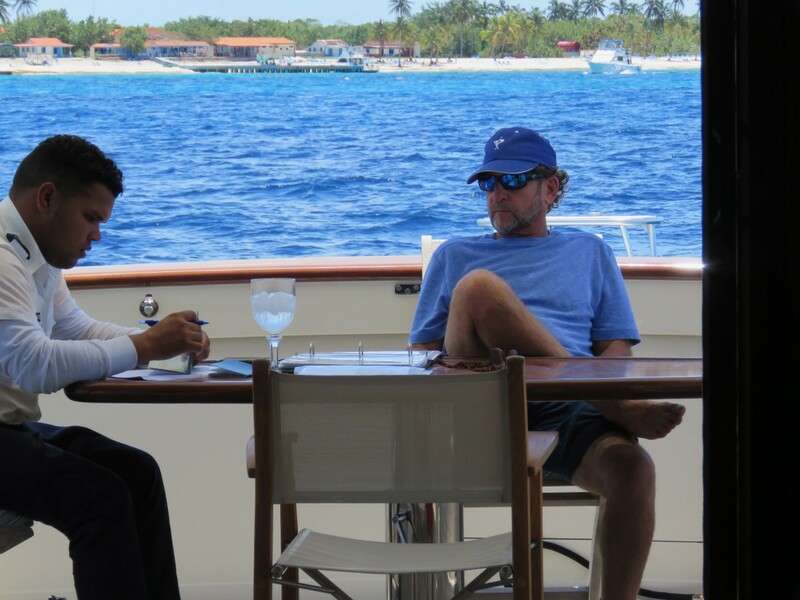 Finally, we saw the amazing words “THE ABOVE PERMIT HAS BEEN APPROVED.” In 2017, our Fleming 65, Blue Pearl, became the first U.S.-flagged pleasure craft to get permission for an extended time in Cuba. 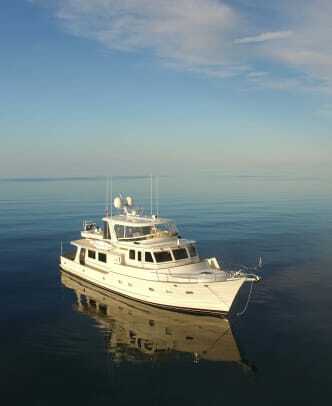 And we were more than ready to spend two months cruising the west and south coasts. Our official purpose for being in Cuba was “Projects of an Environmental Nature,” under the auspices of the International SeaKeepers Society. Our job would be taking lots of photos of the natural environment, both above and below water, for research and humanitarian purposes. We were required to submit a detailed itinerary for every day we would spend in Cuba and to keep a daily journal logging our activities. 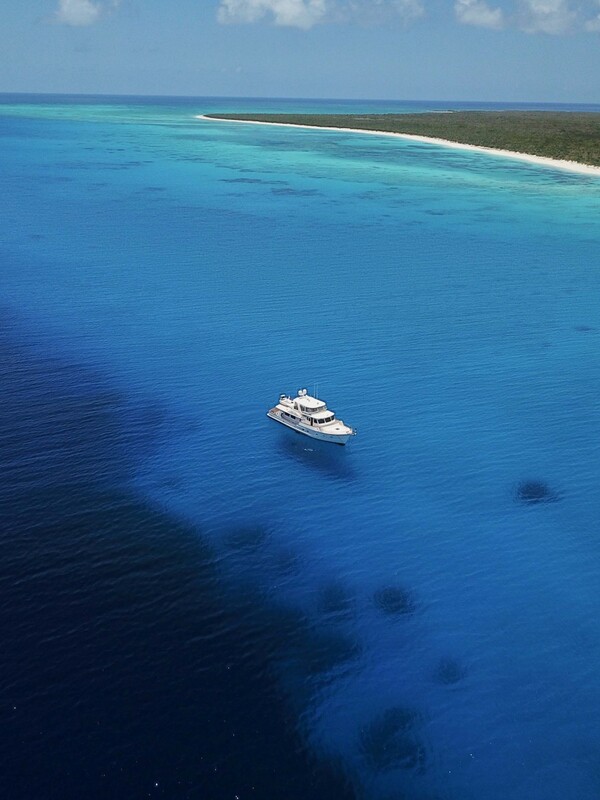 Perhaps the most remote anchorage in The Bahamas: Hogsty Reef Atoll. 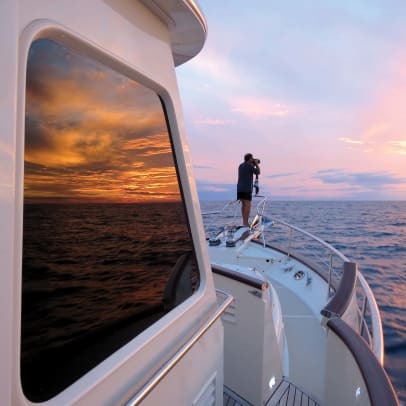 In contrast, cruising The Bahamas is all about freedom. There are zero issues for Americans who want to go there. English is the language of The Bahamas. The U.S. dollar is accepted everywhere. Cell phone towers serve every settlement. 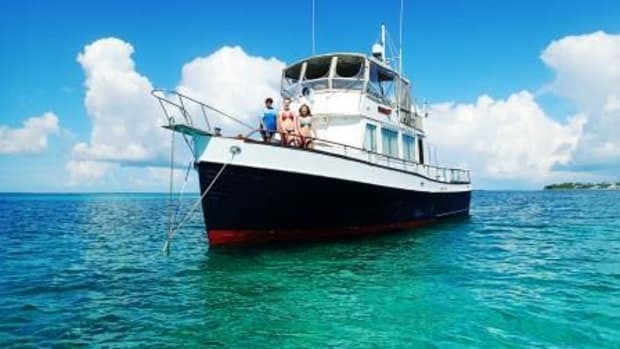 With a cruising permit and fishing license you can be an explorer with the freedom to venture to the 700 islands and 2,000 cays that make up The Bahamas, and anchor with very few restrictions other than in the protected Land and Sea Parks. Our time in The Bahamas is enjoyed as a leisurely experience of self-sufficient meandering among quiet out-islands and small-town settlements. Compared to this, a trip to Cuba is culture shock. Classic American car in Cuba. Since it was our first trip to Cuba we knew we had to see Havana. 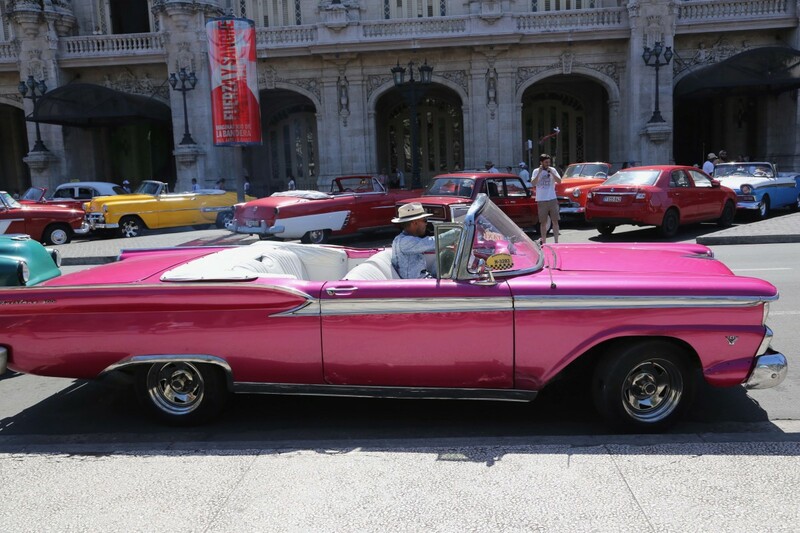 The sight of old American cars filling the streets in Havana made us feel like we had been catapulted back to 1958, and the vertigo of time warp was enhanced out in the rural areas where we’d see horse-and-buggy taxis passing fields being plowed by oxen. 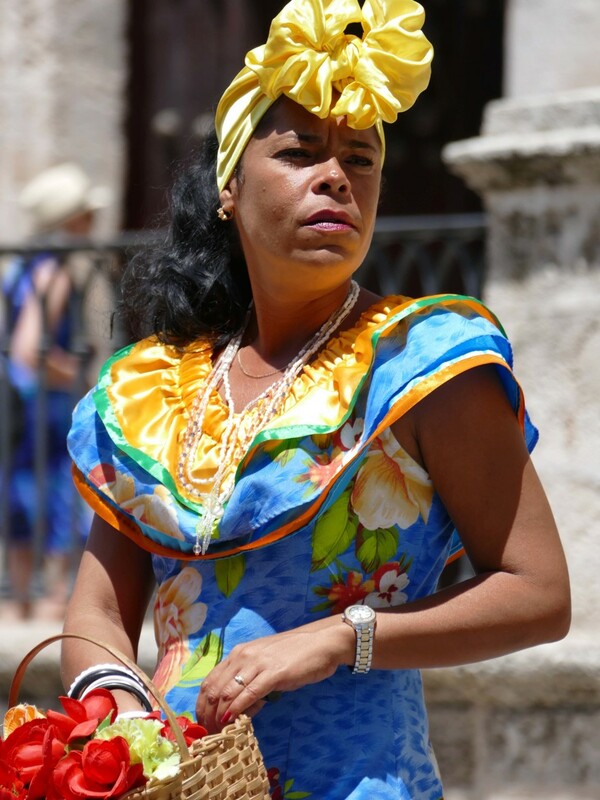 Though the transportation seems lost in time, the Cuban people are not; they are universally well-educated, and, like nearly everywhere else, plugged in to their smartphones. Our plan was to move counterclockwise around mainland Cuba, visiting a wide variety of islands before reversing our course to come home. Our m.o. is to seek the remote settlements and uninhabited places, and we spent two-thirds of our time in these places, anchoring in far-flung areas for 40 days and spending 20 days moored or docked at marinas. Crystal clear water at our anchorage at Cabo Frances, Cuba. From Havana we circled to the west and soon slipped through an opening in the barrier reef to shallow passages dotted with quiet mangrove islands. We were pleased to find a string of lighthouses marking the dangerous reef and channel markers leading us in. Cayo Levisa was our first stop in this island group, and we chose to anchor alone in a cove out of sight of the small resort there. But soon we were joined by a sailboat flying the Canadian flag. Immediately the captain lowered his dinghy and came over to say hello. Turns out he was a co-author of the freshly published Waterways Guide to Cuba, Addison Chan! He was generous with his advice, and our long chat over coffee and charts was absolutely invaluable. Who gets that lucky? 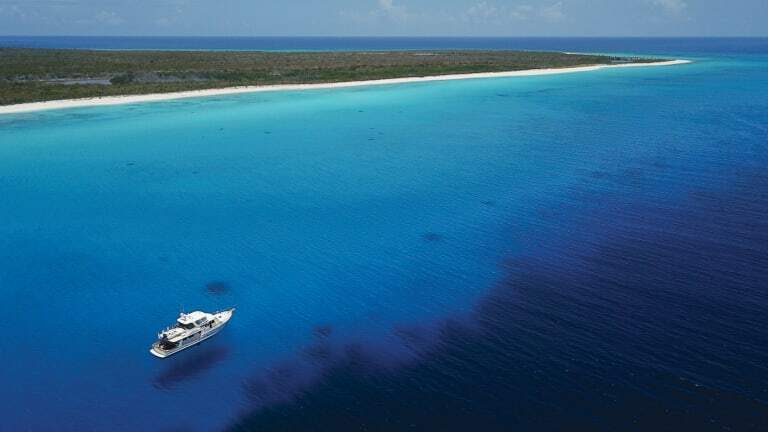 A favorite island in this group, Cayo Buenavista, is veined with creeks and lagoons. On our first day there, a downpour caught us off guard while we were exploring in our tender. It was well worth getting drenched to pause silently in a lagoon, listening to the birds and the drumming of approaching rain. The barrier reef nearby is lush with corals and loaded with colorful sponges and tropical fish. In three days there, we loved having the place all to ourselves. 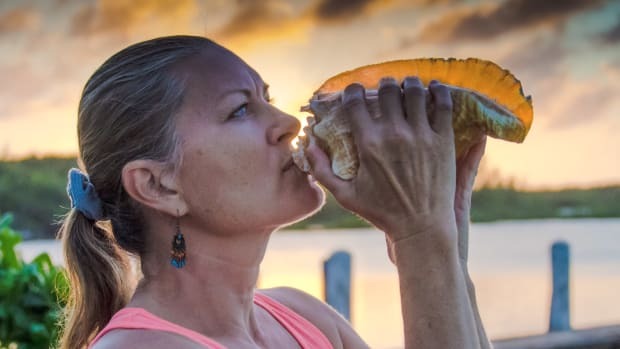 Ringing Cuba on the south there are three archipelagos of small undeveloped islands and cays, all protected from the open Caribbean by coral reefs. We anchored at seven of these islands. Diving the reefs off the south coast of Cuba. Getting up close and personal with marine life was the fun way of fulfilling our work for the SeaKeepers. Blue Pearl is equipped with a compressor and tanks for scuba diving, and we went diving as much as sea conditions allowed, which sometimes meant not at all. A great many days were windy and rough so scuba diving on the outside of the reef was impossible; but those were good days for tootling around in the tender or kayaks. 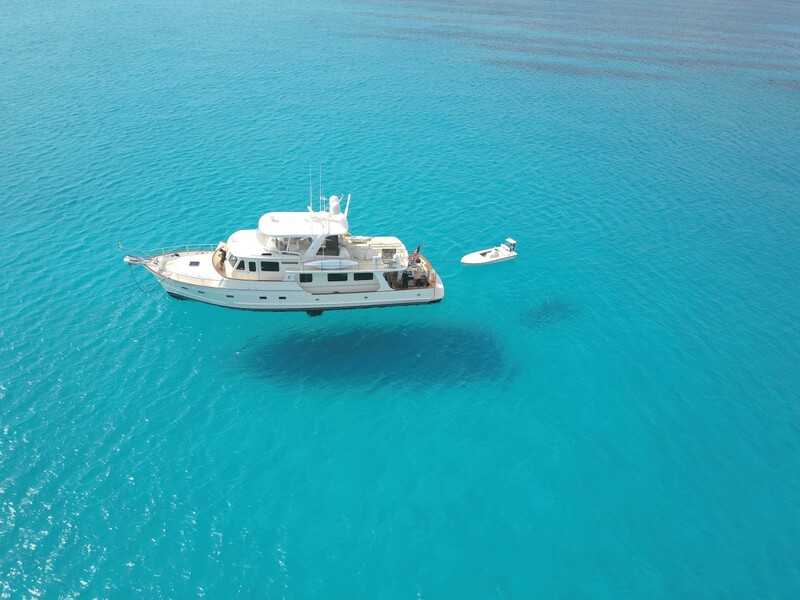 At Cabo Frances, clear water over white sand made the boat appear to be floating in mid-air. Although there is wind protection only from the north, it was a perfect anchorage for scuba diving. 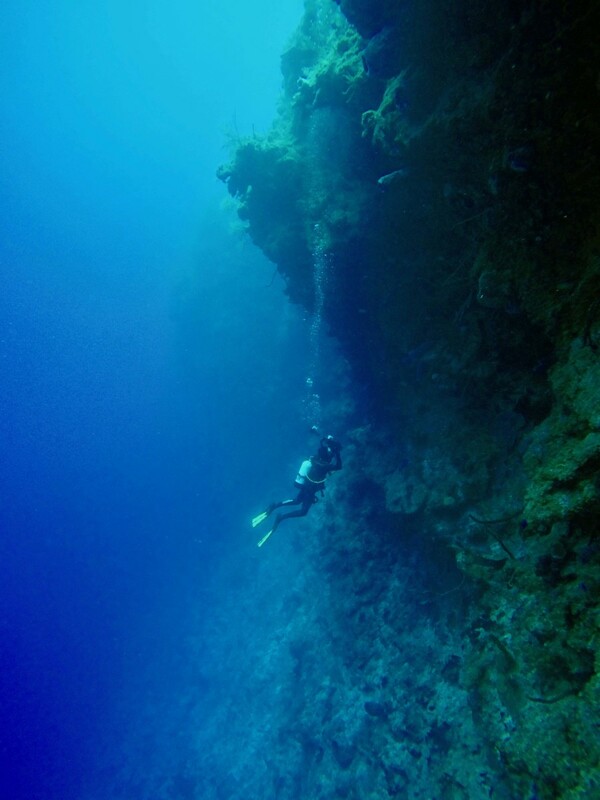 The crest of the steep coral wall is only 27 feet deep, so you can make a deep dive over the dropoff or poke around the shallow reef for as much bottom time as you like. 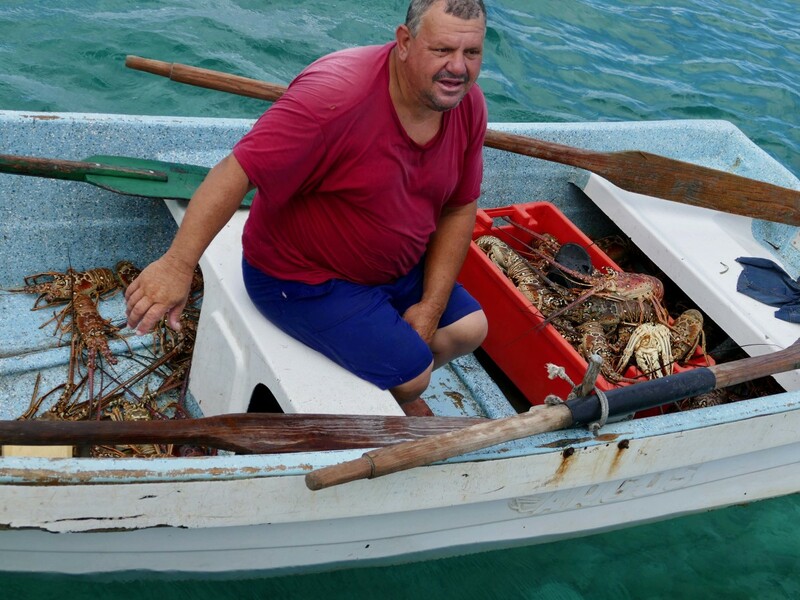 Park Ranger at Cayo Campos offers a gift of lobsters. 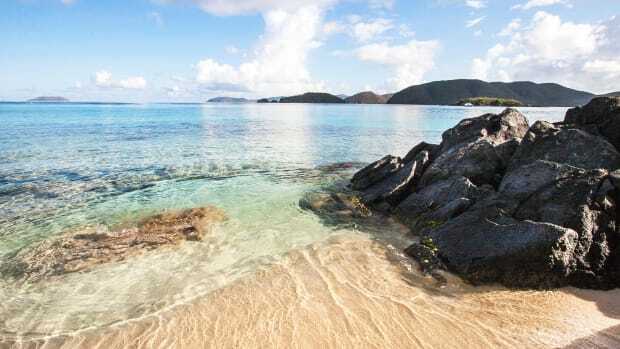 Most of these southern islands are protected as national parks or wildlife preserves. Some of our most interesting days were visiting with the game wardens who work these outposts. 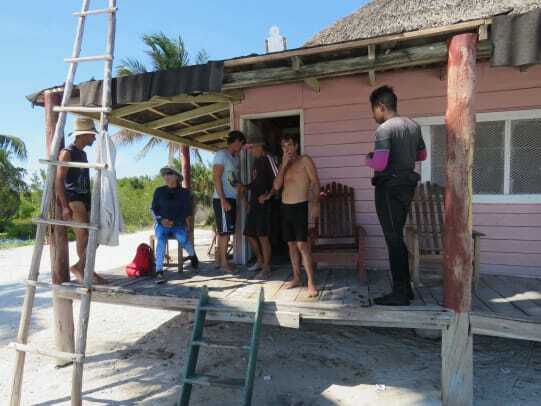 We met the wardens on both Cayo Juan García and Cayo Campos. Wardens live in bare rustic cabins for 20 days per shift, then return to their homes for 10 days. One day we noticed the rangers at Cayo Campos rowing hard against the wind, so Don took our tender and offered to tow them back to their camp. In return we got a gift of nine lobsters and an invitation to come to lunch the next day. We asked what we could bring and got a veritable shopping list: cooking oil, toilet paper, toothbrush and toothpaste, disposable razors, a bath towel, fish hooks. Lunch was awesome, though: snapper, lobster, rice and beans, amusing storytelling by the rangers, and surprising entertainment by a troupe of crab-eating macaque monkeys that live on the island. Further east, Cayo Largo del Sur is a different world from the smaller islands. It has been developed specifically as a resort with several luxury hotels, a floating dock in the marina, a small chandlery, a dive shop, and an exceptionally helpful marina manager named Pire. 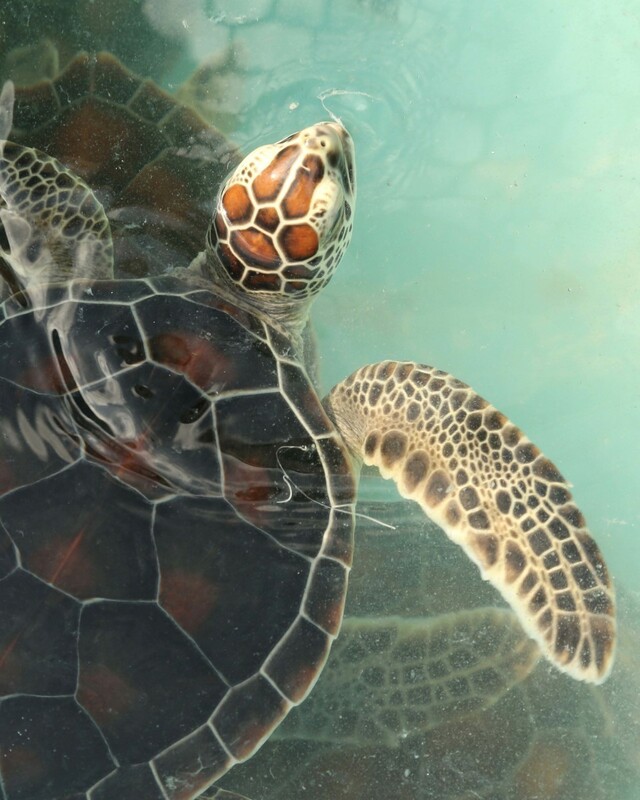 The Sea Turtle Rescue Center is on Cayo Largo, and if you are lucky enough to be there at the right time of year, you may either walk the beach with the head biologist, Gonzalo, to recover eggs from a turtle nest, or watch the hatchlings released into the sea. During our trip, our excursions ashore not only carried us to colorful small towns, rich agricultural areas, and glorious waterfalls in a national park, but provided us with offbeat ventures in provisioning and gave us the opportunity to spend whole days with our Cuban drivers, learning more about life in this unique country. Before heading off to Cuba we armed ourselves with every chart and guidebook we could find. The books we found to be the most useful were ones by Cheryl Barr, Nigel Calder, and, published just two weeks before our trip, the new Waterways Guide coauthored by Addison Chan and Nigel Calder. In addition we would now recommend the Facebook page called “Cuba Land and Sea” as a terrific forum for getting up-to-date information. As soon as we were away from Havana, we were dismayed to find that our NavNet plotter’s charts were nearly worthless. Our GPS location registered correctly but the charts showed no detail whatsoever. We worked around this by entering waypoints that were described in our guidebooks, and we relied on our iPads with two navigation apps in particular: Both Navionics and NV Charts were accurate and detailed. While Cuba is more likely than The Bahamas to have aids to navigation, lesser channels are often not marked, so we relied on visual navigation and reading the color of the water just as we do in The Bahamas. 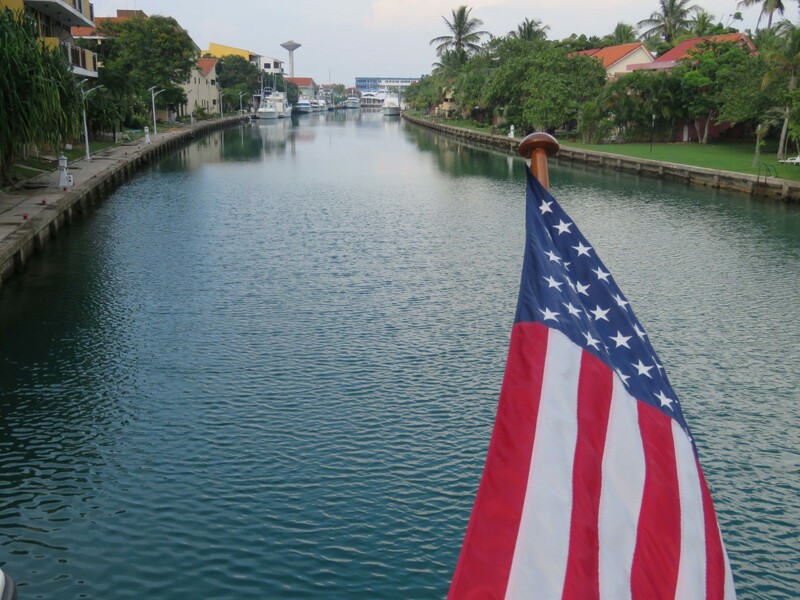 As an American vessel in Cuba we never felt the freedom that we get in The Bahamas. There was always a sense of caution in our movements. After all we had been required by the U.S. government to document our daily activities to fulfill our purpose for travel to Cuba. And we understood that we were potentially always under observation by the Cuban government as well. Foreign vessels must check in and check out with the Guarda Frontera at each port. You could think of the Guarda Frontera as a cross between the U.S. Coast Guard and Homeland Security. But in some ports, the Guarda has no boat. One time we had to dinghy to the beach, pick up the Guarda and bring him back out to our boat to inspect the vessel and check our paperwork. Sipping a cold Coke at the cockpit table, he asked us a few questions, checked our passports, and looked at the customs and agricultural papers from Havana. And then he took our precious “despacho” (the cruising record that we needed to get stamped both coming in and departing from each port) to hold until we checked out. The greatest difficulty with cruising in Cuba might be finding out what exactly the rules and regulations are. We got conflicting information, sometimes from the same official. When we first asked if we could get a fishing permit, we were told by the Guarda that there are no permits. But then he said that there would be no problem if we were just fishing for food. Another time we told a Guarda our next destination would be Jardines de la Reina. He grinned and said, “You’ll love it!” Then the next morning he apologetically told us we would not be allowed to go there at all. In Marina Hemingway near Havana. The day we departed from Cuba to return to the U.S., President Trump announced his intention to tighten restrictions on U.S. travel to Cuba. Today you would not be able to lawfully make the same trip we did. 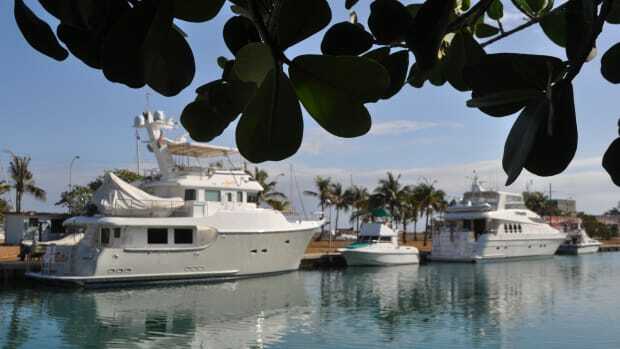 Six marinas around the country are now off limits, as are quite a few hotels and resorts and even some retail stores that might affect your provisioning. 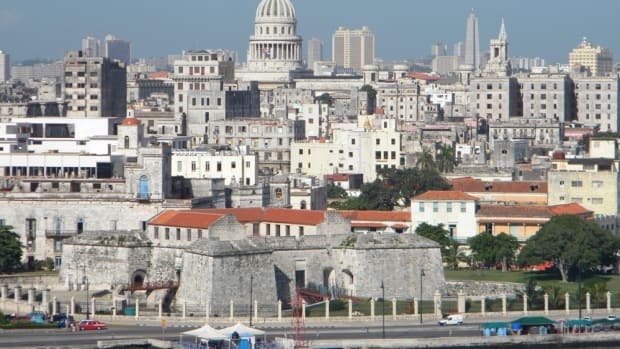 Search for “Cuba Restricted List” to find the complete official list of restricted entities, or better yet, enlist a knowledgeable travel agent for advice in planning your itinerary. During our cruise, Blue Pearl certainly did stand out in a big way, and not just because we flew the U.S. flag. For 50 days straight we didn’t see another motoryacht. While we stayed comfortable on our Fleming, our interactions with fishermen who work from tiny boats that suffer from a lack of available parts for maintenance and repair and seem barely able to stay afloat—brings home the reality of life for ordinary Cubans.